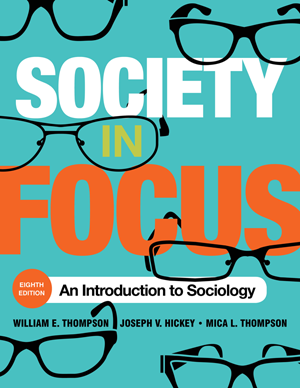 Welcome to the Companion Website for Society in Focus: An Introduction to Sociology, Eighth Edition by William E. Thompson, Joseph V. Hickey, and Mica L. Thompson. Examining the role of mass media and information technology in contemporary society, Society in Focus emphasizes the increasing diversity and globalization of societies everywhere. It is designed to help you think clearly and critically about sociological issues, concepts, and methods. Questioning is at the heart of this approach; every element of the text is designed to challenge you to evaluate social issues and, guided by the sociological imagination, to clearly formulate your own position. By asking questions that demand sociological and creative thought, you will be reminded that your conclusions and decisions, as well as your non-decisions and inaction, may have important social consequences. This open-access Companion Website is designed to reinforce the concepts covered in Society in Focus, Eighth Edition. You can review and enhance your understanding of each chapter using the interactive Flashcards, self-graded Quizzes, and Applying the Sociological Focus activities. A full range of teaching materials accompany this text, including an instructor’s manual, test bank, Respondus testing software, PowerPoint® slides, and LMS cartridge. Instructor ancillaries are password-protected. For access to the teaching materials, please visit Society in Focus and Sign in if you are a registered user. First-time users should Register then email us at textbooks@rowman.com.